UniFirst Facility Services for healthcare businesses support infection control goals, reduce costs and labor time, and help eliminate needless shortages. In facilities large and small, cleanliness affects patient healthcare experiences. Win the battle of positive perceptions with your patients, visitors, and employees with a UniFirst Facility Services Program. 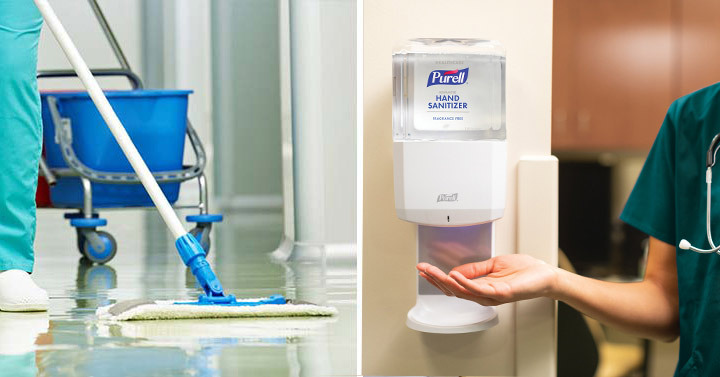 We'll help you reduce housekeeping and maintenance costs with our healthcare and hospital cleaning supplies that help ensure a safer, cleaner, healthier, and more attractive environment. All UniFirst floor mats are certified as “high traction” by the National Floor Safety Institute (NFSI). To help with your infection control precautions, UniFirst delivers fresh mops, cloth cleaning towels, and microfiber wipers… and picks up all your soiled ones on a regular schedule. We maintain inventory, perform hygienic laundering, and replace any worn out items, so you always have what you need on hand, all for one low weekly fee. UniFirst Restroom Services include installation of dispensers, ongoing maintenance, and refills. Reduce costly waste with convenient dispensing systems featuring portion controls, generous outputs per refill, and greater economy. Our Cleaning Solution Dispensing Services offer a complete line of cleaning solutions in economical concentrates for use in our wall-mounted dilution and dispensing systems. See the UniFirst Uniform Rental Catalog and the UniFirst Facility Service Programs Catalog for our complete line of uniforms and facility service products. Start UniFirst Healthcare Facility Services today. Call (800) 455-7654. Through value-based Rental, Lease, and Purchase Programs, UniFirst serves all occupations and outfits nearly 2 million uniform wearers daily at over 300,000 customer locations throughout the U.S. and Canada.